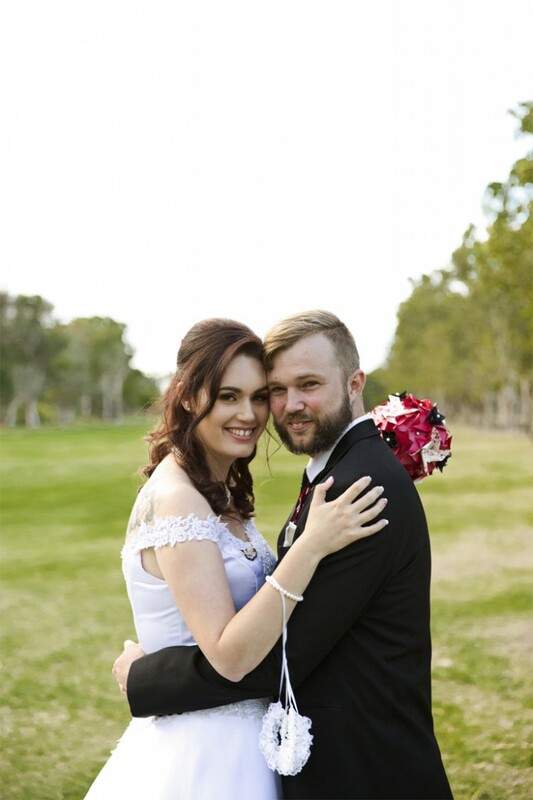 In May this year my daughter Sarah and her husband Michael invited family and close friends to join them in celebrating their marriage with a beautiful ceremony and reception held at the Redland Bay Golf Club in Brisbane. Before we go any further, I must give a very big thank you to Michelle Schulga Photographer. 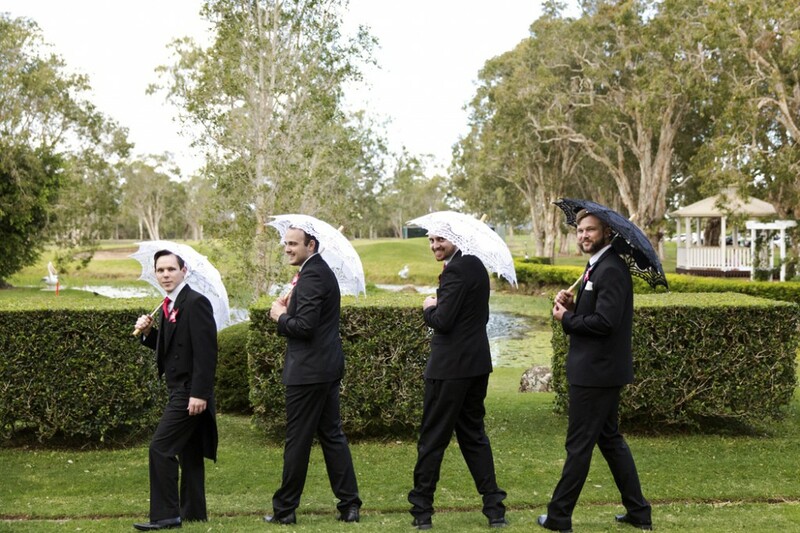 The always amazing and very talented Michelle travelled to Brisbane to capture special memories throughout the day, and has very kindly given permission to share her gorgeous images in this post. Thank you, Michelle! Photo credit: Michelle Schulga Photographer. 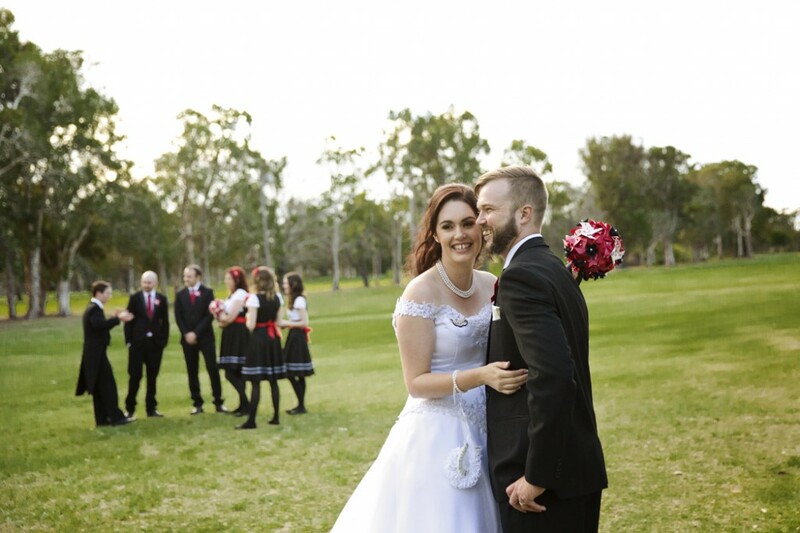 Sarah & Michael celebrated their marriage in Brisbane earlier this year. 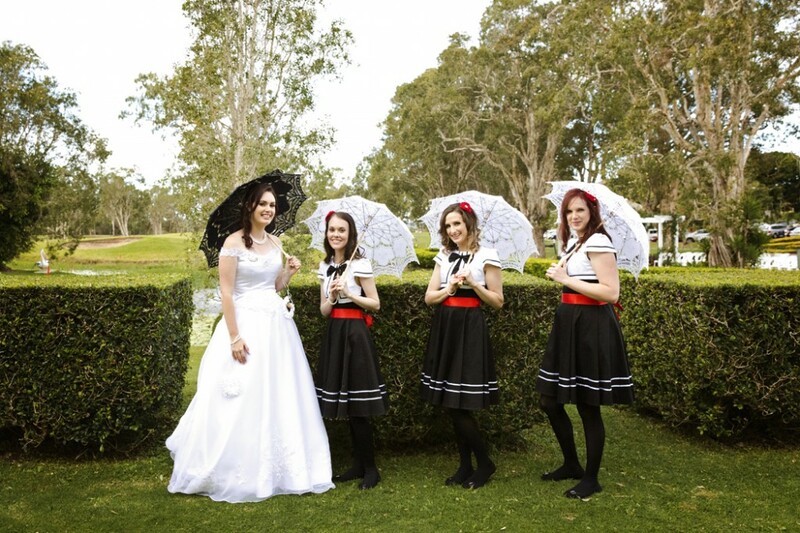 Sarah & Michael chose red, white, and black as their wedding colours. 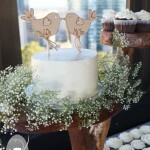 They incorporated owls and cherry blossoms into their decorations, and the addition of pinwheels into the bouquets, table decorations and on the cake added a little bit of a whimsical touch! 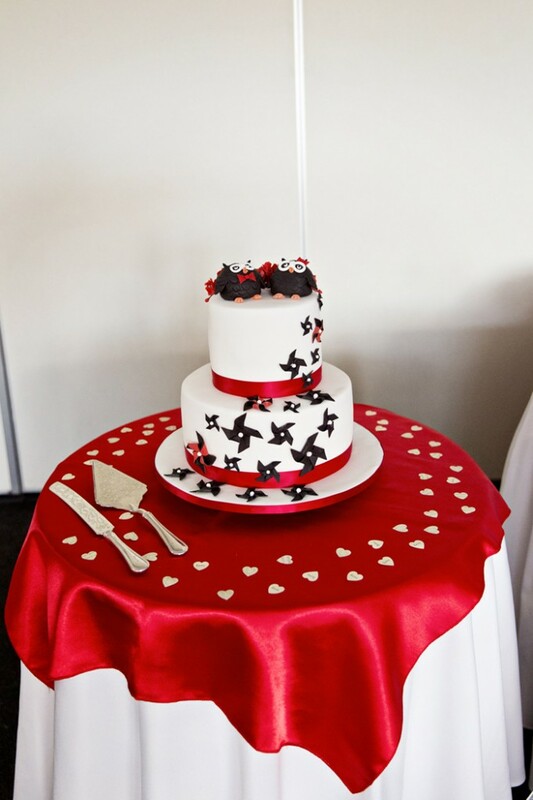 A custom made cake adds so much joy and personality to an occasion, and it was my pleasure to design the cake together with Sarah. 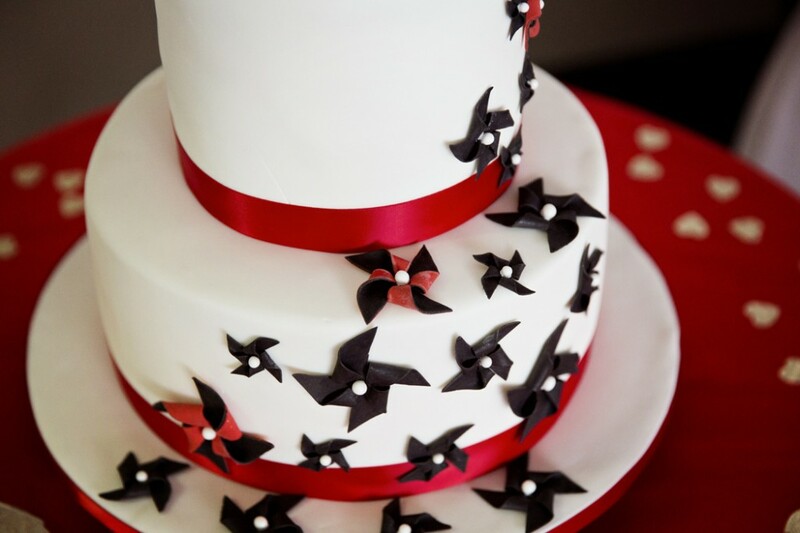 Both tiers were made in a larger height than standard, which gave me a beautiful, tall canvas onto which I was able to place a swirling cascade of edible pinwheels. A fondant covered baseboard allowed me to continue the design right down to the very bottom, with four of the pinwheels placed directly onto the board. Each pinwheel was made by hand, including the white ‘pearls’ in the centre. 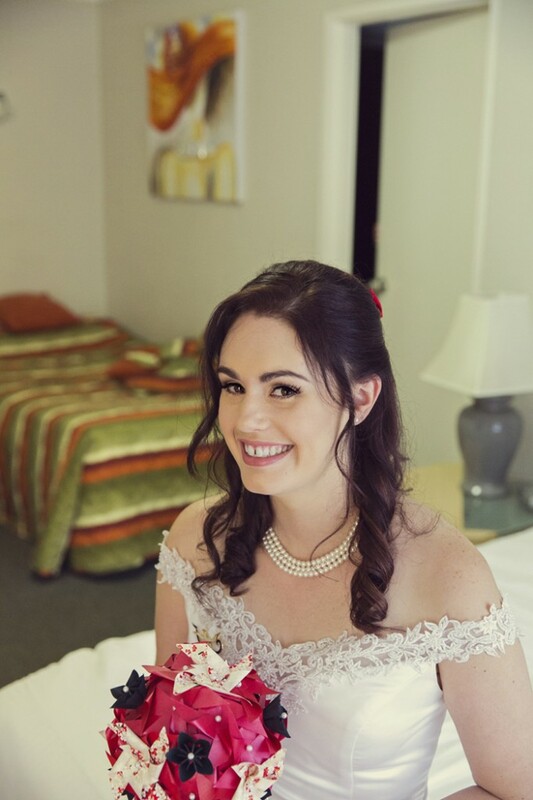 Knowing that Sarah’s paper flower bouquets by LenaLime would include pearls in the centre of the flowers; I thought it would be a nice touch to add the pearls to the centre of the pinwheels on the cake. The effect was perfect! Just a touch of white in the centre of the black pinwheels made such a difference to the overall look of the cake as the pinwheels seemed to ‘pop’ against the white fondant covering. Pinwheels featured in table decorations, bouquets, and on the cake! Photo credit: Michelle Schulga Photographer. 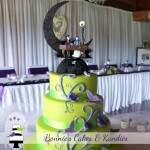 Cake: Bonnie’s Cakes & Kandies. 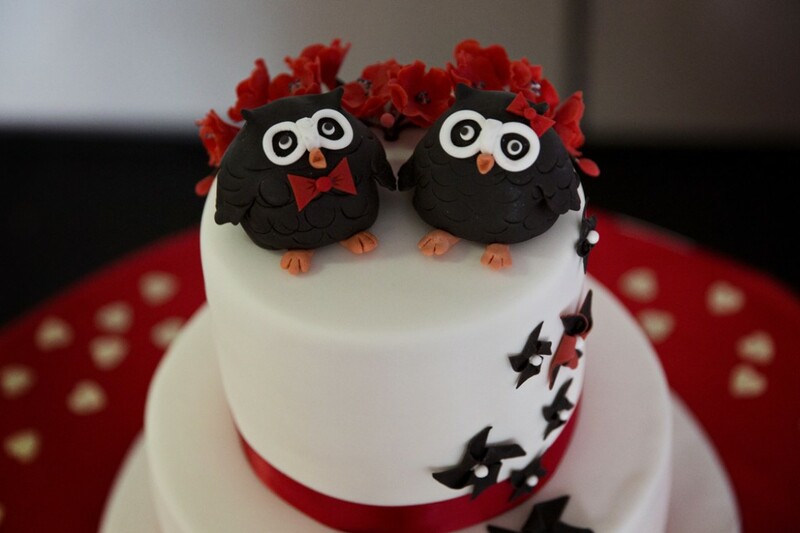 I made the two owl cake toppers in a similar design to the owls featured on Sarah & Michael’s engagement cake. 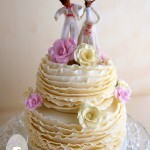 They perched very happily on the top tier, and were framed by a spray of icing flower cherry blossoms at the back. 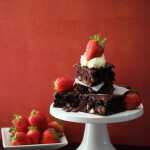 …and then the same flavours repeated. Celebrant Trish Whittaker conducted a beautiful and heartfelt ceremony, and I was very proud to watch as Sarah and Michael exchanged their vows. 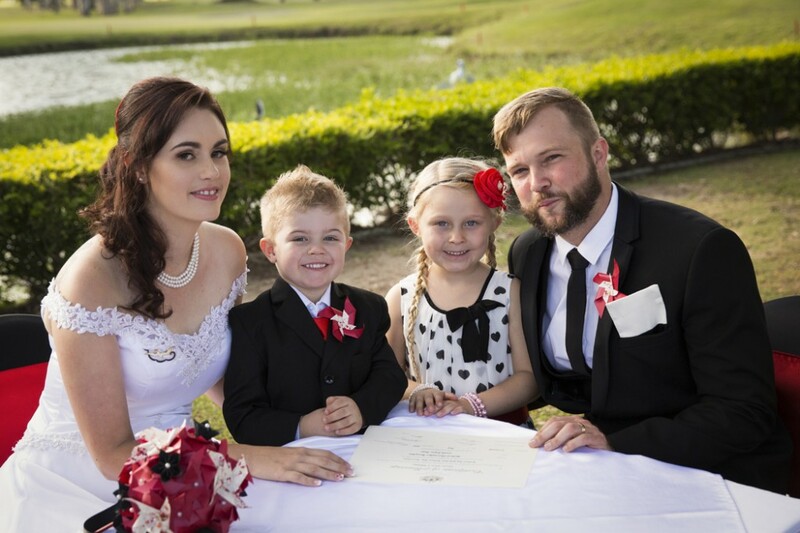 Scarlett & Harrison – their beautiful flower girl and page boy – were included in the service, with the children reading a poem about love and family. The love that they all have for each other was almost palpable and I will happily admit to wiping away a few joyful tears of my own! 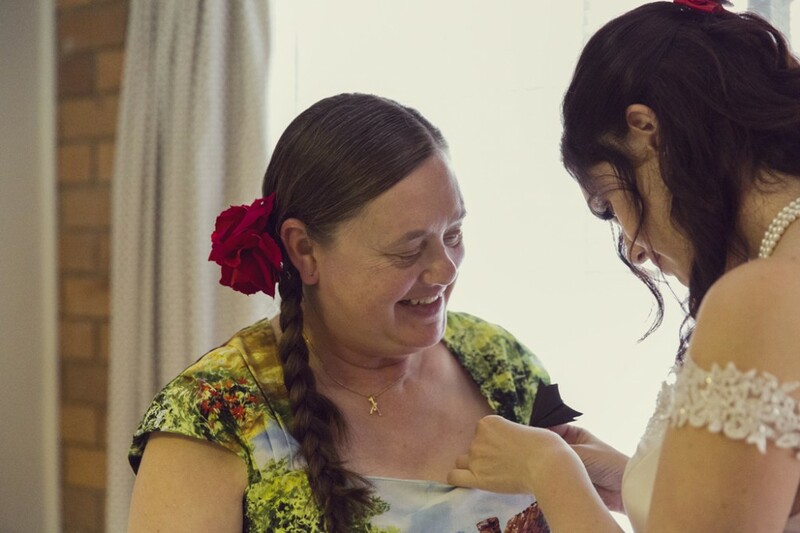 Sarah looked absolutely beautiful on her wedding day. Photo credit: Michelle Schulga Photographer. 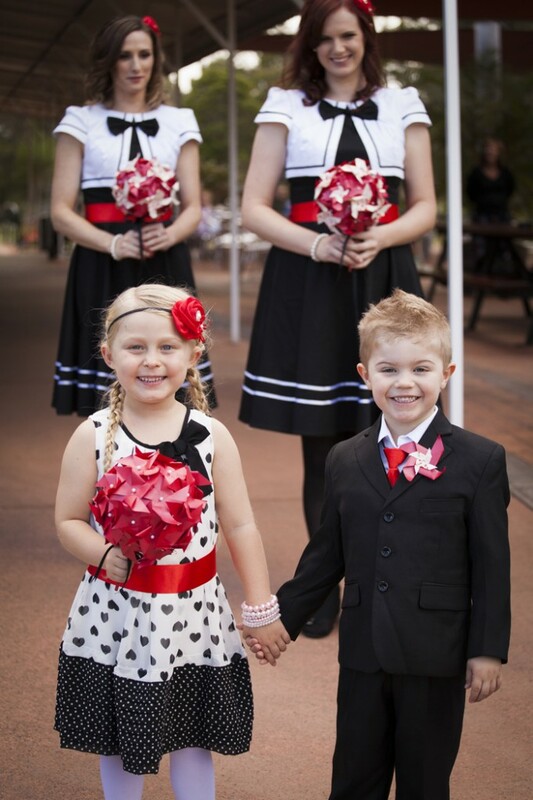 Paper flower corsages and boutonnieres for the parents’ and grandparents were made by LenaLime. Photo credit: Michelle Schulga Photographer. Photo credit: Michelle Schulga Photographer. 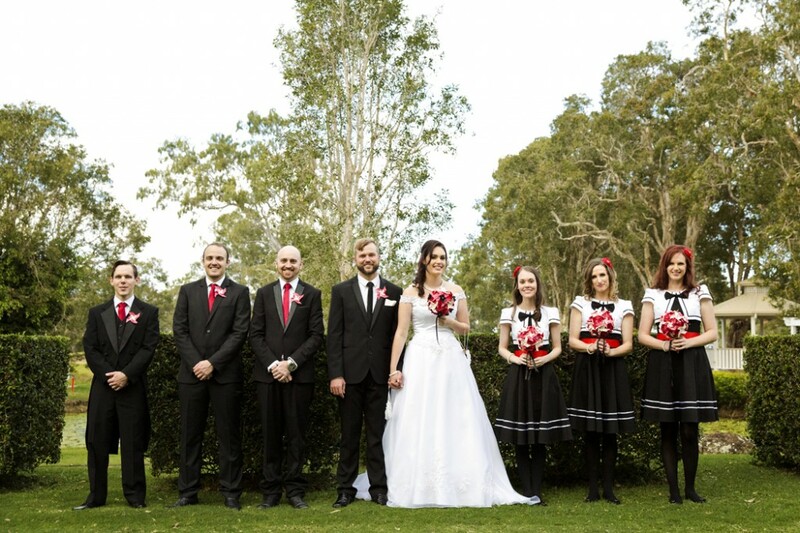 The newlyweds with their bridal party. Photo credit: Michelle Schulga Photographer. 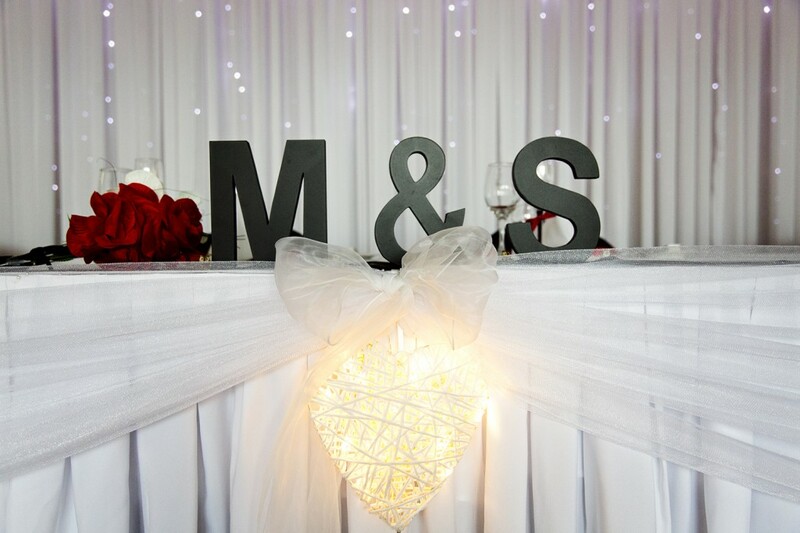 Congratulations to Sarah & Michael. Photo credit: Michelle Schulga Photographer.